Brighton born and bred Sean Ridley is a DJ for the BFBS. He’s been described as the “Kate Adie” of BFBS Radio and as Britain’s answer to Adrian Cronauer (Good Morning Vietnam). Well known for his unique mix of (sometimes irreverent) forces’ wit, satire and banter, Sean has entertained the British Forces in some of the world’s trouble spots, and has arguably caused more trouble amongst them than some of the conflicts they’ve been involved in. An ex-Soldier himself, Sean previously served with the British Army in the Royal Signals and has also worked in the electronics and radio industry. Sean got involved with BFBS after hearing an interview on Radio Brighton. At the time the BFBS was looking for ex-army personnel to join their radio team. Initially Sean worked for them part-time but became a full time staff member in 2000. Sean is currently part of the BFBS Operational Team specialising in Operational Areas (war zones). His latest ‘holidays’ have included Kosovo, Bosnia and Iraq. When Sean came on leave to his home town, Ian Bonham, the producer of his show, emailed the Mayor’s office with a request. Apparently, Sean never misses an opportunity in his radio shows to extol the virtues of Brighton and Hove. Ian, jokingly suggested that his promotional efforts should be recognised in some way. This week that was done. Sean was invited to have tea with The Mayor, Councillor Gary Peltzer Dunn in the Mayor’s Parlour. 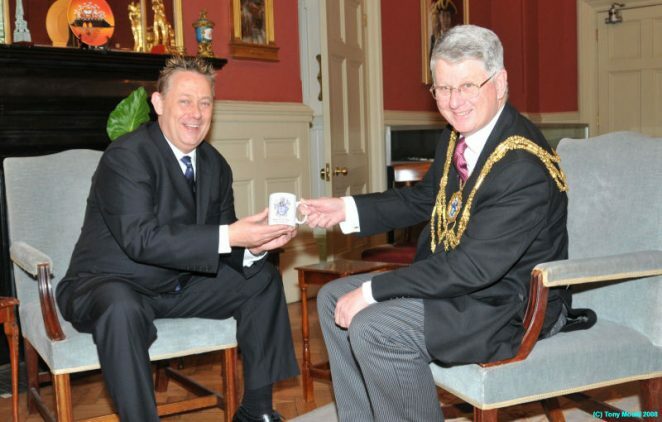 He was presented with a Brighton and Hove silver notebook, and a mug and cufflinks showing the city crest. It was great to see you Sean. Keep up the good work as our very own roving ambassador.